New York City formally passed legislation this week that steers punishment for offenses such as public urination, littering, and drinking in public away from criminal court. The legislation was championed by City Council Speaker Melissa Mark-Viverito, a Hillary Clinton supporter who appeared on the campaign trail ahead of the Democratic primary. She said on Wednesday that the reform "is going to change trajectories for countless New Yorkers," according to an Associated Press report. The City Council on Wednesday passed a series of criminal justice reforms to sharply curtail the punishments for low-level offenses such as littering and peeing in public, an overhaul intended to help unclog the courts and jails of the nation's largest city. The Criminal Justice Reform Act alters the penalties for certain offenses, including possessing an open container of alcohol in public. Though the offenses will remain illegal, the legislation steers them to civil court rather than criminal court. Public urination and most offenses in public parks will be downgraded from misdemeanors to violations and reduces the available jail penalties to just one day for violations. Currently, jail time could stretch up to 90 days for such offenses. The package of bills was unveiled by City Council Speaker Melissa Mark-Viverito on Monday. "This is a huge win for criminal justice reform," she said. "For too long, our criminal justice system was broken and it was time we took action. The Criminal Justice Reform Act will prevent tens of thousands of people from getting a criminal record for low-level, non-violent offenses and over its lifetime it is going to change trajectories for countless New Yorkers." In anticipation of the reform bill, NYPD officers had already been ordered to stop making arrests for the crimes like public urination in March. 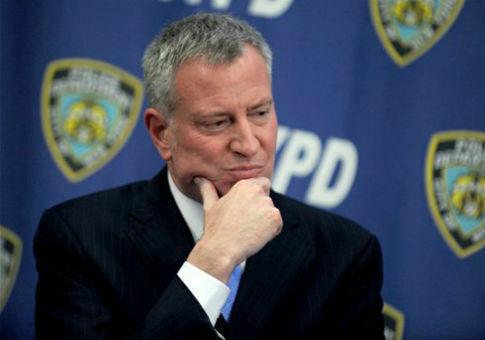 The bill is strongly supported by New York City Mayor Bill de Blasio, who also is a Clinton supporter. Mark-Viverito, who maintains her support of a terrorist who killed four New Yorkers in the name of winning Puerto Rico its independence, has been criticized by colleagues in the city council as a "communist" who "doesn't care about America." She infamously refused to stand up for the pledge of allegiance during a September 11 memorial service at the World Trade Center. This entry was posted in Politics and tagged Bill de Blasio, Hillary Clinton. Bookmark the permalink.